WKU’s Department of Library Special Collections lost a valued former colleague with the May 6, 2016 death of Elaine “Penny” Harrison. A Connecticut native, Penny met WKU alumnus Lowell H. Harrison while working at New York University. After they married in 1948, she followed him to London on his Fulbright Scholarship, then to Texas, where Dr. Harrison taught at West Texas State University and Penny earned a master’s degree in history. 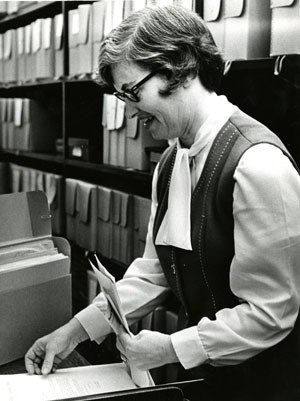 In 1967, Dr. Harrison returned to Bowling Green to teach at his alma mater and Penny joined the Kentucky Library (now part of the Department of Library Special Collections), where she served as manuscripts librarian until her retirement in 1986.